Starring: Martin Sheen, Marlon Brando, Frederick Forrest, Dennis Hopper, Robert Duvall, Albert Hall Jr. 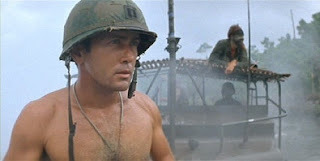 Gut, determination and a whole lot of ego from Francis Coppola was the engine which not just got Apocalypse Now made but made it great. Coming off the Godfather films, Francis Coppola was at the height of his creativity, the height of his influence and undoubtedly his confidence. When filmmakers find themselves in this type of position it's wonderful to see filmmakers push themselves creatively. And he couldn't have set goals any higher than Joseph Conrad's Heart of Darkness. One of those legendary Hollywood properties deemed unfilmable. It's one of cinema's great page to screen translations, injecting the chaotic American involvement in the Vietnam into Conrad's material. The combination the machoness of John Milius's original script, the dense poetry of Michael Herr's voiceover and Coppola's hallucinogenic vision, it's a miraculous combination of the written word and the visual medium. Coppola famously filmed a million and half feet of film, for months, often straying from the script and re-writing as he went along. Looking at both the Redux and the original theatrical versions, it's interesting to see the creative choices Coppola made in terms of narrative plotting. In the original version continuity is purposely eschewed in favour of a hallucinatory series of set pieces. The USO playmate show is just such a scene. It’s a lengthy sequence, which doesn’t serve the narrative but the absurd and strange nature of the war. In the Redux version, an additional scene with the bunnies meeting Willard is reinstated, but by removing this scene and never referencing the bunnies again, the scene is compartmentalized, complimenting progressive journey, or odyssey undertaken by Willard and his crew. Same with the character of Kilgore as played by Robert Duvall, who disappears from the story after he says his famous line, 'Some day this war's gonna end'. It's a perfect line to close his character off with. But in the Redux version continuity is reinstated with a couple of additional scenes with Kilgore, showing his discombobulation after having surfboard stolen. It's an interesting scene to watch but takes the macho lustre off his character and for the worse smooths over the punchy editing of the narrative. As a stand alone sequence the lengthy French plantation scene is terrific. It deserves to be in the Redux version, but admittedly is too long for the theatrical version, in particular it's placement at the end of the second act. It's a shame it found no place in the original version, it's one of the best scenes in the entire film. The opening dialogue scene, after trippy helicopter ghost/hotel sequence, is still a classic. So perfectly written, performed and directed. I think my favourite part is the silent civilian character played by Jerry Zeismer, who we see reacting to the questioning with a stoic professionalism. His only line in the scene comes at the end, when he dramatic utters Milius’s best line, ‘terminate with extreme prejudice. How awesome is that. Arguably the most incongruent aspect of the film is Coppola’s kooky electronic score, co-written by Francis and his father Carmine. When we first hear the music it comes after Zeismer's dramatic line, ‘terminate with extreme prejudice’ which sends Willard on his mnission. We then hear the drone of synthesizers which is always jarring to me. It feels out of place and arguably tempers the punch line of that scene. Yet as the film moves along and Coppola delves further into the psychology of war, the score successfully merges with the all other sights and sounds of the picture. The Blu-Ray special edition, entitled ‘Full Disclosure” features both the theatrical and Redux cuts in addition to Hearts of Darkness and newly produced special feature interviews. The picture quality is stunning, the most eye popping is Vittorio Storaro’s colours which never looked so vibrant and bold. It's also presented in the original uncropped 2:35:1 aspect ratio for the first time.